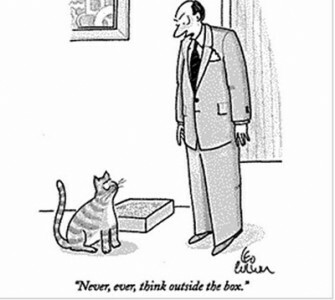 Leo Cullum, one of the premier modern cartoonists working in The New Yorker, died on October 23 in Los Angeles. He was 68 years old. A family member told the New York Times the cause of death was complications due to cancer. Cullum was a son of New Jersey: born in Newark, raised in North Bergen. His father ran a trucking company, and a family friend was James J. Braddock. Cullum's mother studied fashion illustration, and encouraged her son's talent. The future cartoonist attended catholic prep school and later his father's alma mater, Holy Cross, graduating in 1963 with a degree in English. A profile in an alumni magazine revealed that Cullum did very little art at the school -- he did some work for a student publication and designed a few posters -- primarily because Cullum couldn't afford to take a not-for-credit course. After college, Cullum served in the Marine Corps and learned to fly as an officer, a set of skills he later employed in over 200 missions in Vietnam (he was stationed at Da Nang and Chu Lai), and later as a commercial airline pilot for more than three decades. He chose TWA among prospective employers for the then-rare opportunity to pilot international flights. It was during the frequent stopovers that came with that job that Cullum, always a devoted doodler, renewed his interest in cartooning. Cullum broke into the New Yorker in a roundabout way. His initial cartoons were rejected, but in a longstanding practice that was becoming less of a standard procedure at the magazine as younger cartoonists both wrote and executed gags, Cullum's jokes were purchased for illustration by Charles Addams. His first cartoon joke, illustrated by Addams, appeared in the publication in 1975. He also began placing his work into other gag-market publications, before finally placing something in the New Yorker in 1977. By this time, Cullum had been transferred to Los Angeles and had taken up residence in Malibu, although he remembered well the experience of hitting the Manhattan-based cartoon editors with his peers in the tradition of selling work directly to such clients. In terms of the cartoons themselves, Cullum's work was very heavy on absurd gags, frequently taking a clearly discernible tableau such as the administration of certain professional duties or some sort of relationship common to nature and then infusing it with a twist based on the reader's initial expectations for such a scene. Cullum might blend human and animal behavior, or in whimsical fashion play to the worst stereotypes of a certain profession, or simply take the joke in some odd, fanciful direction. Some of his best gags were twists on standard gag set-ups: man at desk, doctor with patient on table, man addressing animal. In a significant way, Cullum was a modern standard-bearer for a potent New Yorker tradition of cartoon making where a caption wrenched a humorous drawing in a direction that emphasized the marriage of word and image by making the joke absolutely dependent on their partnership. He was known as one the consistently best and most accessible gag-men in the publication's history; he was certainly one of its most popular cartoonists in the 1980s and 1990s, a favor that extended to his relationships with its editors. Although he was never known as one of the magazine's powerful visual artists, Cullum's cartoons were frequently separated from their caption and employed as the art portion of the popular caption-writing contest feature. The Times said that Cullum was published 819 times in the magazine, with work appearing in yesterday's edition (how much, if any, Cullum work there is in reserve is unknown). As is the case with most modern New Yorker contributors, Cullum's work in print in book format splits between being one of many cartoonist in certain group efforts and a variety of single-themed books: Scotch & Toilet Water (2003), Cockatiels For Two (2004), Tequila Mockingbird (2004) and the recent Suture Self (2009). The first three were from Abrams; the fourth from Andrews McMeel. The Times also notes that a Cullum cartoon was the first post-9/11 cartoon that appeared in the magazine, in the early pages of a publication two weeks later. Other regular cartoon market for Cullum were Barron's and Harvard Business Review. 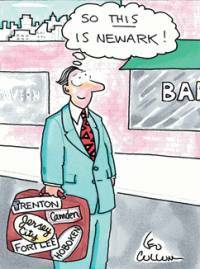 He retired from TWA eight years ago, after which he pursued opportunities in advertising in addition to his cartoon output. Cullum was diagnosed with cancer five years ago. Cullum is survived by a wife, a brother, and two brothers. 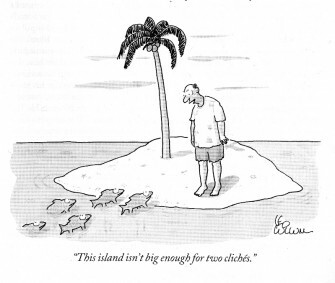 The Cartoon Bank's collection of Leo Cullum cartoons may be found here. An animated Cullum cartoon can be found here.